If sterling customer care on a Carr Golf trip to Ireland was an Olympic event, our Peter Keighery would win the gold medal every four years hands down. He’s as world-class as they come. There are only two types of people on Earth: good friends of Peter and those who haven’t had the pleasure of meeting him on a Carr Golf adventure yet. While Peter’s official title is “customer service manager,” that hardly tells the full tale as for the past 29 years he’s worn a variety of hats for our clients savoring a golf pilgrimage to the Emerald Isle and U.K. including being a driver, expert tour guide, boon companion, hilarious storyteller, talented musician, and even a whistler extraordinaire. He is a such seriously talented whistler even birds are jealous! 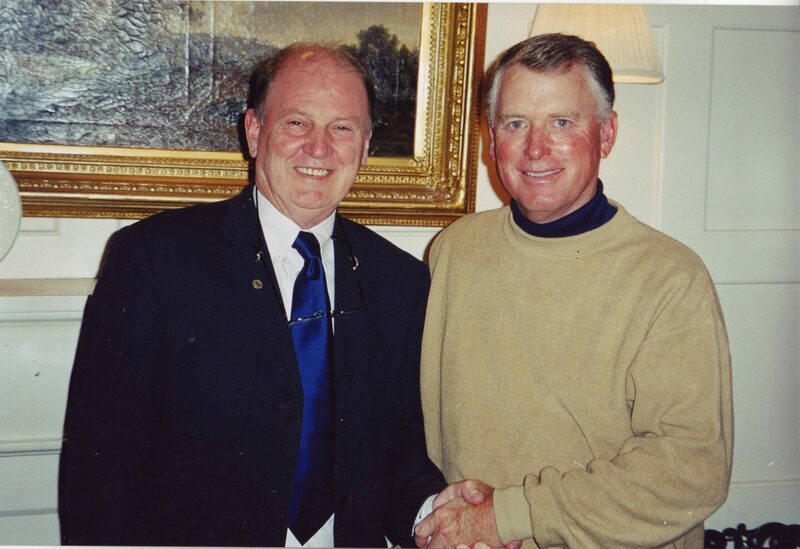 Peter Keighery and U.S. Vice President Dan Quayle. He has also looked after myriad golf superstars, celebrities and VIPs for Carr Golf over the years including Arnold Palmer, Jack Nicklaus, Seve Ballesteros, Sam Torrance, Curtis Strange, Wayne Gretzky, U.S. Treasury Secretary Jon Snow, Michael Douglas, Catherine Zeta Jones (whom he sang a duet with while tickling the ivories), Dan Marino, “Boomer” Esiason, U.S. Vice President Dan Quayle, Wayne Huizenga and show biz legend Irving Azoff who has become a great friend to Peter. Peter with Catherine Zeta Jones & Michael Douglas. Perhaps no event on our annual roster of events showcases Peter’s many talents as does the annual World Invitational Father & Son Tournament played yearly in Southwest Ireland on acclaimed Waterville Golf Links. This is the 29th year of the sold-out global gettogether. The friendly Butler Arms Hotel serves as the unofficial home of après golf fun as Peter, known affectionally as “The Piano Man,” has tickled the ivories on the beer-stained upright and sang songs there for the past 28 years. On final evenings, it’s not unusual for Peter to play until sun-up before a bunch of guys would get on a bus and go straight to Shannon airport to catch flights home. This year Peter will be entertaining the participants from a new piano recently bought by the hotel. Peter’s new toy at The Butler Arms Hotel – arrived just in time for this years World Invitational Father & Daughter / Father & Son Tournaments. Roddy continued, “In 2009, I remember he was doodling the day away with the great Arnold Palmer in Kinsale. Peter introduced Arnie to the local bookie shop for a few quid on the upcoming British Open as well as the local pub where they enjoyed a few pints of Guinness and a long lunch.” Becoming the best of friends, Arnie reciprocated the stellar hospitality shown by Peter, recording a personal message for Peter’s 70th birthday, which brought him to tears. A young Peter with two-time Masters winner Ben Crenshaw.